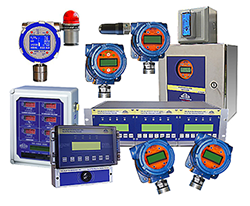 Mil-Ram provides gas detection equipment for many applications in numerous industries under a wide variety of operating conditions. Specific knowledge of each application and environment is not possible so we are conservative in our recommendations in the interest of safety. Calibration recommendations are noted in specific Operating Manuals. Industrial gas detectors of all types, regardless of sensor technology, require regular and routine calibration using certified gas standards. Actual field calibration with gas of known concentration is the most reliable method of validating proper operation and performance of the device. In safety related applications, calibration maintenance is especially critical. Factors influencing stability of gas sensors are largely related to environmental conditions where detectors installed under more hostile operating conditions (temperature, weather, gas exposure, contaminants, etc.) typically require more frequent calibration maintenance. In addition to any applicable company policies, agency regulations, etc. dictating calibration frequency, calibration practices should be further influenced by actual performance history of the equipment under actual operating conditions at specific locations. For example, it is possible in an installation to have one or more detectors that are installed under more hostile conditions where sensors necessarily require more frequent calibration maintenance and possible replacement. 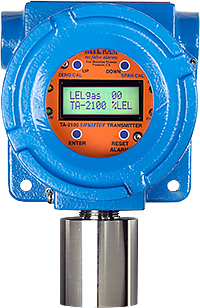 Gas sensors typically reflect the conditions of the immediate environment in which they are installed. Calibration frequency is best informed by qualified, on-site plant personnel that have intimate knowledge of the specific operating conditions over time, related characteristics of the target gas, company policies, regulations, application and intended purpose of the equipment (e.g. safety, process, etc.) as well as any previous experience with the equipment. It is further recommended that the user consult with qualified safety professionals (e.g. industrial hygienist) to develop and maintain good calibration practices. Safety critical applications require the most attention. Consider these factors and any other factors deemed critical to the application in establishing effective and responsible calibration practices.